It is located within the residences of La Reunion Golf Resort & Residences, one of the most recognized golf clubs in Central America, characterized by being surrounded by an extraordinary landscape. Located just 20 minutes from La Antigua Guatemala. Its design with open spaces, with the purpose of creating a space where all the guests can share, allows to recreate integrated environments that have received tourists and friends from all continents. With view of the Fuego, Acatenango, Agua and Pacaya volcanoes, Casa La Reunion allows you to enjoy one of the ecological reserves of the center of Guatemala that will make you live unforgettable moments. If your passion is golf, Casa La Reunion will allow you to enjoy a unique course in the world. "Fuego Maya, the championship 18-hole golf course, designed by the legendary architect Pete Dye, is sure to test even the most expert golfers with its architecture. In addition, this magnificent course offers breathtaking views of Fuego Volcano and the Pacific Coast. The three services can be arranged from La Aurora International Airport. • The main house has 8 rooms each equipped with bathroom and closet, distributed in two modules of construction of three and two levels respectively. 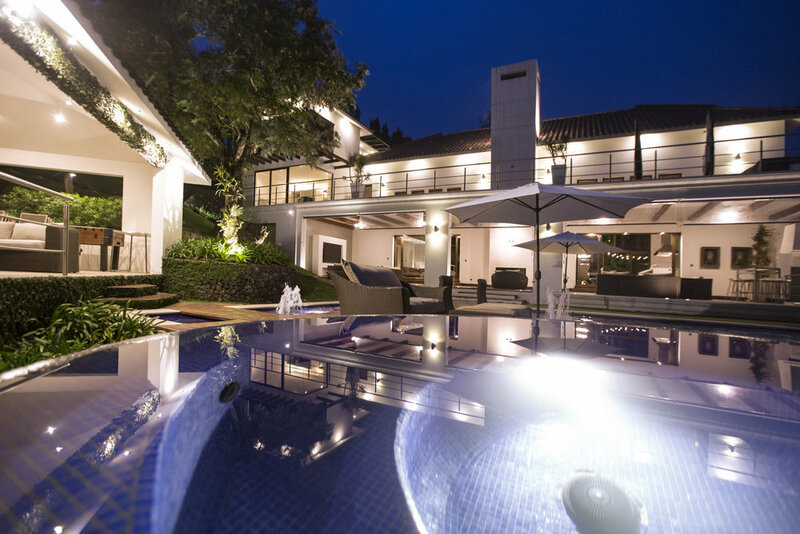 Both houses converge in the social area where you will find the infinity pool, Jacuzzi, external grill, 2 outdoor fireplaces, rest area with hammocks and private gardens. Private parking is offered on site at no additional cost. Conscientious and responsible with the care of the resources, from its design and construction, it was thought in architectural details that allowed their reuse. That is why, on the floors of the common areas, the same logs of wood employed in the foundry of the main house were used. Casa La Reunion has an LED lighting system in all environments for energy optimization and saving. The internal water heating of the house is carried out through solar thermal heating tanks. It also has its own wastewater treatment plant used for watering the gardens. The house has trained service personnel. If required, you can choose the option of hiring a chef or the beauty salon service with professional stylists available to guests. La Reunion Golf Resort & Residences offers nanny services for the care of children. (Request services prior to the stay). Shuttle service from the house to the main Club House is available at no additional fee. Because it is found within La Reunion Golf Resort & Residences you can choose to hire El Mirador restaurant service with charge in the house. Another service available is the beauty salon. The use of Fuego Maya golf course can also be booked in addition to use of the gym, heated pool and jacuzzi, tennis and squash courts, soccer, basketball, and minigolf. La Reunion Golf Resort & Residences features natural attractions such as bird watching, horse rental for internal tours and marked hiking trails with unique views and rappel routes. Within La Reunion Golf Resort & Residences you can also find a delicatessen in La Vinoteca for the purchase of gourmet drinks or snacks.